Universities make public their purposes, goals, beliefs, views and values in “mission statements”. Thanks to these statements, their long term intentions can be defined, and the present and future of the institution can be represented (Ketterer, 2015) before a local, national and international audience. University mission statements were almost unknown until the late 1980s and today have become near universal (Saunton & Morrish, 2011) and are easily accessible on line. 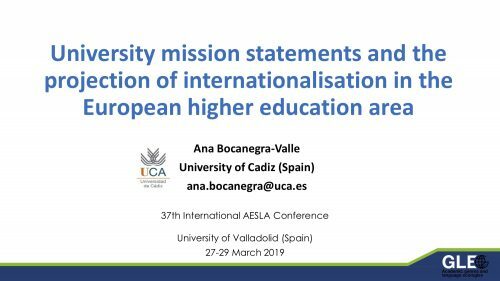 This paper sets out to examine the presence of the concept of internationalisation in university mission statements and, in particular, the ways internationalisation values are defined and articulated in these pieces of institutional discourse. This investigation draws on textual data gathered from a corpus of twenty European universities listed among the first hundred top universities in the world (according to the QS World University Rankings® 2018). This dataset was coded and qualitatively analysed by means of NVivo 11 Pro. Focal questions were: (1) does internationalisation appear as a key issue in university mission statements?, and (2) what internationalisation-related values are contained in these statements and how are they prioritised? The preliminary analysis showed that most universities place internationalisation high on their agenda and that it is an inclusive concept linked to other institutional values and goals like research, excellence or networking. Findings also point at implications for higher education policies in the local context. In the last decades, internationalisation has become one of the main strategic objectives of universities as an indicator of excellence, recognition and international visibility (de Wit et al., 2015; Maringe and Foskett, 2010). European and national policies include a wide range of strategies regarding internationalisation efforts in the form of mobility, international collaboration, and language strategies. One common element to the previous strategies is the presence of English, considered to be the language for international communication in the higher education context (Coleman, 2006; Ferguson, 2010; Hultgren et al., 2014). The purpose of this study is the analysis of the role played by English in internationalisation through the examination of universities’ Language Policy (LP) documents in order to understand how language ecologies in non-Anglophone universities integrate English, the national language and/or local languages. According to Spolsky (2012), language policy consists of three main elements: practices, ideologies, and management. There are multiple studies on practices, ideologies and language attitudes towards multilingualism in higher education and the inclusion of English as an academic language but it is appreciated a lack of critical studies on the role hold by policies and strategic documents that regulate such practices in the national context. 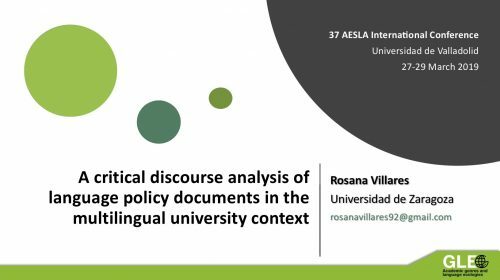 Critical Discourse Analysis was used as the methodological approach for this study where 37 institutional LP documents from 29 Spanish universities were examined. The qualitative software used for the inductive coding was Atlas.ti v8, which facilitated the identification and classification of key themes in terms of ideologies, practices, and management; as well as analysing how they are expressed in a textual level. Preliminary findings suggest that some of the main themes found in relation to English are its positioning as the de facto language of internationalisation; the different areas where English is expected to be used, i.e. 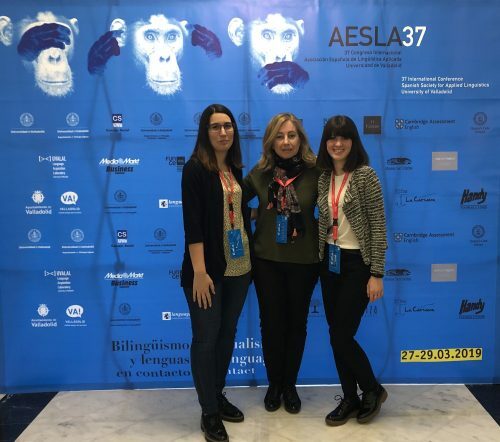 teaching, research, services and institutional contexts; the presence of language requirements and bilingual education; or the use of English as the language to access specialised knowledge and reach an international audience, among others. The identification of these themes will allow further analysis of mismatches between top-down expectations and bottom-up realities in relation to the design and implementation of institutional policies that could bring closer theory and practice. In the last decades, the emergence of new technologies has given rise to multiple innovations in the field of education, and nowadays digital tools play a relevant role in foreign language learning. The affordances offered by multimodal resources can be particularly useful in Content and Language Integrated Learning (CLIL) by contributing to facilitating the understanding of relevant concepts and the acquisition of the necessary language to engage in communicative exchanges about them. In this paper, I present a proposal for the ICT-enrichment (i.e. 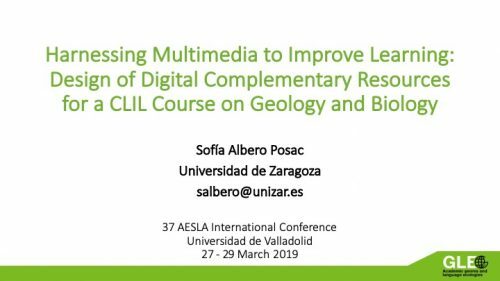 the enhancement through the addition of supplementary digital resources) of a CLIL course on Biology and Geology. I will first present the pedagogical principles that should guide the design of digital materials for the enrichment of CLIL courses [e.g. the integration of the 4Cs (Coyle, 1999) and an adequate adjustment of linguistic, conceptual and procedural demands (Ball et al. 2015)]. I will then describe the different materials designed for this specific course (e.g. activities involving matching, labelling, watching interactive videos, collaboratively creating their own learning resources and reflecting on their learning process) and will analyse how these materials help the teachers to address the needs of students in a particular educational context and support the achievement of CLIL’s dual aims.